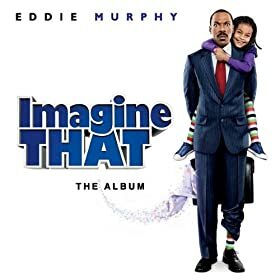 If you stacked all the Beatles tribute albums one on top of the other with the best on top and the worst on the bottom, the soundtrack for the new family-friendly Eddie Murphy vehicle Imagine That would be closer to the ground than it would be to the album on top. Even if we just compare it to other Beatles cover film soundtracks of the past (I Am Sam, Across the Universe, etc.) Imagine That doesn’t fare very well. The work of director and soundtrack co-producer Karey Kirkpatrick can’t be faulted for a lack of heart, but from the first notes of Matthew Sweet & Susanna Hoffs’ version of “Got To Get You Into My Life”, it’s pretty clear that he and co-producer Mikal Blue may have taken on a bigger challenge than they anticipated. After all, these are songs by The Beatles – not only the biggest band of all time but the most commonly covered band of all time. For the most part, listeners have heard so many versions of these tunes at this point that unless the musicians knock them out in a genre that has yet to be discovered we’ve probably heard something resembling their version before. That’s not to say that the album is unenjoyable or even unpleasant. On the contrary, each song here gives the listener something to hook on to, whether it’s the cutesy vocals of the Paulist Choristers Of California on “All You Need Is Love” or the vague recognition of Colbie Caillat’s voice on “Here Comes the Sun” and the “Here Comes the Sun” reprise at the end of the album. And there are a few pleasant surprises on this album. Both Tyler Hilton’s “I’m Looking Through You” and Hope’s “I Want To Hold Your Hand” are more than simple covers – they’re both played in a dirgeful, expressive way that brings new light to the infamous words we’ve all come to recognize. Though both songs start to sound a little bit too “Christian Rock” before they wrap up, they’re each impressive in their own right and give a new edge to this otherwise generic album. 1 user commented in " Music Review: Imagine That The Album (Original Soundtrack) "
Fans of Matthew Sweet should check out his contribution to the Bigtop soundtrack.